The European Right is generally believed to be opposed to political Islam. This is certainly true for most right-wing conservative and populist parties. The story with the Far-Right, however, is different. While activists of the Far-Right regularly indulge in violence against Muslim immigrants, at the same time there is also a widespread but little-known affinity for political Islam in its circles, where it is seen as an ally against common enemies. Two recent events illustrate this. 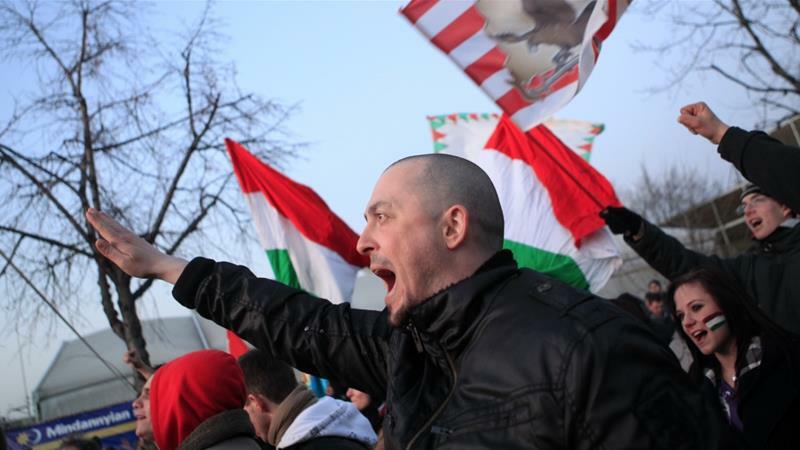 First, in January 2018, Vona Gábor, the head of the Hungarian Far-Right party Jobbik, praised Islam as a bulwark against Western globalization and the decline of traditional values. He also advocates that Hungary’s foreign policy should move closer towards Iran. Second, in December 2017, a German court convicted an ISIS sympathizer for having planned a terrorist attack against German soldiers. Interestingly, the wannabe-terrorist had been a Neo-Nazi just two years earlier. Before his conversion to Islam, he had published an article on a Far-Right blog crudely titled “He who incites against Islam hisses with the tongue of Judaism.” Similar stories of Neo-Nazis becoming jihadists can be found in other countries. This reflects a pattern. The love story between the European Far-Right and Islamism is in fact not a recent phenomenon, but now almost a century old. One of the first Western Far-Right activists to openly flirt with political Islam was Robert Gordon-Canning, the foreign policy chief of the British Union of Fascists. An admirer of Islam who had become disaffected with the West and Christianity, he took up the Palestinian cause in the 1930s and tried to act as the Mufti’s spokesman in Britain. He pioneered an amalgam of Far-Right and Islamic anti-Semitism, presenting Zionism as a conspiracy of Jewish bankers, which sought to subjugate or eradicate the Arabs for their imperial interests. In language similar to al-Qaeda, which derisively calls its enemies the “Jewish-Crusader alliance”, Gordon-Canning referred to Zionism as the “tenth crusade”. During World War II, German Nazi propaganda appealed to the Islamic world with a constant stream of anti-Semitic and anti-Western messages, often incorporating Islamic themes. One of the leading propagandists, Johann von Leers, argued that Judaism and Islam represented polar opposites, while Islam and National-Socialism were bound by their shared hatred of Jews. The postwar European Far-Right continued this tradition. One of the leading proponents of an alliance between the Far-Right and political Islam was the Swiss Holocaust denier Ahmed Huber, who reached out to both Neo-Nazis and Islamists. Originally a socialist journalist, Huber converted to Islam in the Muslim Brotherhood mosque in Geneva in 1961 out of sympathy for Arab nationalism, not realizing that the Egyptian regime under Nasser bitterly fought against the Islamists. Under the tutelage of Johann von Leers, who had converted to Islam and fled to Egypt in the late 1950s, Huber adapted Leers’s synthesis of Islam and National-Socialism. Huber was mesmerized by the success of the Islamic revolution in Iran in 1979, which held out the promise of defeating the three Satans: Zionism, Marxism and “the American way of life”, as he wrote, “which is perceived by many Muslims as specific ‘new-yorkish’ and, therefore, in essence Jewish”. Working with both the Iranian regime and the Muslim Brotherhood, after 9/11 Huber landed on a US terror list for financing terrorism. The idea of an alliance between political Islam and the Far-Right is underpinned by shared convictions. To enumerate just a few, first of all a profound and virulent anti-Semitism is fundamental to the Islamist and the Far-Right worldview and helps to explain many of their other beliefs. Second, both movements believe that the world is secretly manipulated by conspiracies to their disadvantage. Third, both movements are ideologically and geopolitically opposed to the West. The German Far-Right, for instance, believed Germany to be a victim, rather than a member of the West. The Islamists equally believe their societies to be victims of the West which is waging a war of destruction against Islam. Moreover, both movements share a similar economic vision. They reject both Soviet-style communism and the Western model of capitalism, which they often see as Jewish. Instead, they advocate a pre-capitalist medieval economic model, which they believe to be a guarantee for a just, or natural order of society, excluding supposedly inferior minorities such as the Jews or the Armenians from reaching a higher position in society. In sum, they represent two models of a revolt against modernity, which have been shaped by their religious and cultural surroundings. The similarity between the Western Far-Right and Islamism has long been recognized. For instance, when Muslim Brotherhood leader Said Ramadan was invited to the United States in 1953, a CIA observer described him as a “political reactionary” and a “fascist type”. However, in our times we seldom find the media and scholars characterizing Islamism as a Far-Right movement. In this context, the Israeli scholar Seth Frantzman has spoken of a “a conscious effort to whitewash the politics of these [Middle Eastern] countries” in order to sanitize Far-Right nationalist and Islamist parties to the western public. Quite successfully, as many on the of the political Left do not shun Islamism. Rather, they have embraced it as an ally against a world order supposedly led by the West or – as they call it – ‘Imperialism’. The rise of political Islam, jihadi terrorism and mass immigration from the Islamic World has shifted the European political landscape in recent years. Embracing the concept of a ‘Judeo-Christian Europe’, the political right increasingly sympathizes with Israel and rejects anti-Semitism. Even some former Far-Right parties, such as the Sweden Democrats, have embraced this new position, not least in order to gain political acceptance. As a result of this development, sympathy for Islamism is nowadays more prevalent in the political Left than the Right. Nonetheless, Far-Right sympathy for Islamism is far from dead: It is in fact full of life in Eastern Europe, where the old political configurations are more intact than in the continent’s western half. Yet despite the mutual attraction, political Islam has always presented a challenge to the Far-Right. While the Far-Right sees political Islam as a positive force, it fervently rejects the immigration of Muslims to Europe for xenophobic reasons. Support for the Shia version of Islamism and concomitantly Iran has always offered an elegant solution to this problem. Shiites represent only a small minority of Muslim immigrants to Europe and are, therefore, perceived as a smaller threat to European identity than their Sunni co-religionists, while Iran has proven to be reliable as an ally in their revolt. Norbert Pap and Viktor Glied, “Hungary’s Turn to the East: Jobbik and Islam,” Europe-Asia Studies 70, no. 7 (August 9, 2018): 1044–45, doi:10.1080/09668136.2018.1464126. “Vom Nazi Zum Jihadisten – Das Krude Weltbild Des Sascha L.,” The German Jihad, February 27, 2017, https://germanjihad.wordpress.com/2017/02/27/vom-nazi-zum-jihadisten/. Graham Macklin, “A Fascist ‘Jihad’: Captain Robert Gordon-Canning, British Fascist Antisemitism and Islam,” Holocaust Studies 15, no. 1–2 (June 1, 2009): 78–100, doi:10.1080/17504902.2009.11087231. Jeffrey Herf, Nazi Propaganda for the Arab World (New Haven, Conn.: Yale University Press, 2009), 261. Martyn Frampton, The Muslim Brotherhood and the West: A History of Enmity and Engagement (Cambridge, Massachusetts: Belknap Press: An Imprint of Harvard University Press, 2018), 279. Seth J. Frantzman, “Whitewashing Far-Right Parties in the Middle East,” Middle East Forum, accessed August 1, 2018, https://www.meforum.org/articles/2018/whitewashing-far-right-parties-in-the-middle-east.